Cape Town - Proteas quickie Dale Steyn says they will show at the WACA in Perth why they are considered as the best bowling line-up in world cricket, reports the Beeld website. Steyn said they simply cannot afford not to fire on all cylinders with the world No 1 crown at stake. South Africa's bowlers struggled in the first two drawn Tests, taking only 23 out of a possible 40 Australian wickets. "It was two Tests in which we didn't fare to well, but it wasn't for a lack of trying. Just like the batsmen try to score a century in every Test, we (bowlers) also aim for five wickets or more - especially against the best teams in the world in one of the toughest touring destinations." South Africa will surrender their No 1 Test ranking to the home side if they lose the final Test, and Steyn says that thought has spurred the bowlers on to up their performances. "There's a lot more urgency because we realise the whole series now depends on what happens in the next five days. 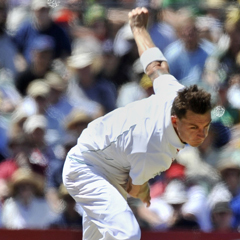 "Hopefully we can get our bowling right from the get go in Perth," said Steyn. Play at the WACA starts at 04:30 (SA time) on Friday.